An Islamic State-affiliated news service called the two San Bernardino terror attack suspects "supporters" of their Islamist cause, but the group did not claim responsibility for the mass shooting. SAN BERNARDINO, Calif. (KABC) -- An Islamic State-affiliated news service called the two San Bernardino terror attack suspects "supporters" of their Islamist cause, but the group did not claim responsibility for the mass shooting. American citizen Syed Farook, 28, and his wife Tashfeen Malik, 29, killed 14 people Wednesday at a holiday banquet for county workers at the Inland Regional Center. The couple wore combat-style outfits and used assault weapons. Both were later killed in a shootout with police about a mile south of the center. The Al-Bayan report Saturday echoed a claim carried Friday by the IS-affiliated Aamaq news agency. The radio report did not refer to the couple as actual members of the Islamic State group. Militants affiliated with IS who carry out attacks are commonly referred to in the group's propaganda as "lions," "fighters" or "mujahedeen." On Friday morning, a U.S. official said Malik pledged allegiance to the Islamic State group and the terror group's leader, Abu Bakr al-Baghdadi, under a Facebook alias and then deleted her messages before Wednesday's attack. The official added that Malik expressed "admiration" for the extremist group's leader under the alias Facebook account, but that there was no sign anyone affiliated with the Islamic State group communicated back with her or conveyed any operation instructions to her. FBI Director James Comey said there was no indication yet that the plot was directed by any other foreign terror group. President Barack Obama was briefed on the latest development of the massacre Saturday. He spoke with Comey, Attorney General Loretta Lynch, Secretary of Homeland Security Jeh Johnson and other intelligence leaders. The team highlighted information that showed Malik and Farook were radicalized, but that there was still no evidence showing links to any organized terrorist group or cell. The FBI added that they are using any and all resources to continue gaining leads on the investigation. 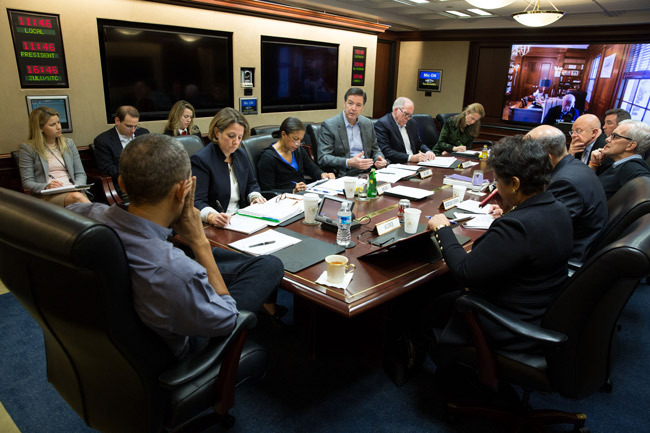 President Obama sits with intelligence leaders Saturday, Dec. 5, to discuss the latest investigation details on the San Bernardino terror attack. The FBI announced Friday it would be the lead agency investigating the mass shooting as an act of terrorism. The agency also acknowledged knowing little about Malik. According to two attorneys representing the Farook family, Malik was a simple housewife who was soft spoken, very private, conservative and isolated. The couple lived a traditional Muslim life in which women were separated from the men and Malik wore a burka. Despite evidence from authorities that the couple became radicalized, attorneys said there was more evidence that said otherwise and that Farook's relatives did not see any indications that the couple held extremist views. But a Pakistani relative of Malik told the Associated Press that she became a more zealous follower of the Muslim faith about three years ago. Malik reportedly moved from her home country of Pakistan to Saudi Arabia, eventually coming to the U.S. in 2014 on a fiancee visa, but Saudi authorities said there was no record of her ever being a resident in the country. The couple had resided in a small, two-bedroom home in Redlands with their 6-month-old daughter and Farook's mother since May. Following the gunbattle, authorities conducted overnight searches of the home that yielded more than 3,000 rounds of ammunition, 12 pipe-bomb-type devices and tools for making more of those explosives. Law enforcement officials have long warned that Americans acting in sympathy with Islamic extremists - though not on direct orders - could launch an attack inside the U.S. Using slick propaganda, the Islamic State in particular has urged sympathizers worldwide to commit violence in their countries.